Mix the soft butter, flour, brown sugar, eggs and chocolate chips together in a bowl. On a lined baking tray, form a disc with half the cookie dough and place in the fridge for 30 minutes. Grease the cake tin and spread the other half of the cookie dough inside the bottom and sides of the tin. Then place the Kinder® chocolate bars in circles inside. After chilling, use a plate on to cut an exact circle of dough the same size at the tin and remove the excess dough. 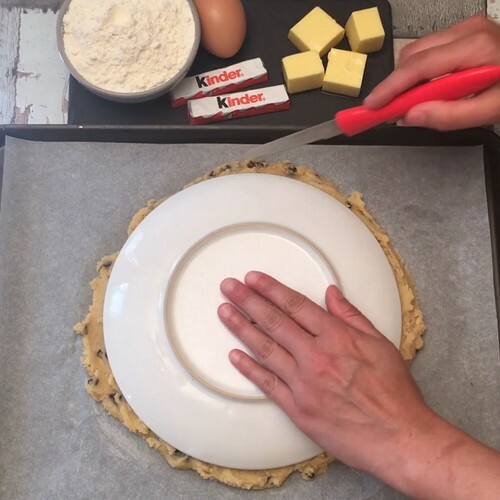 Place the disc of cookie dough on top of the Kinder® chocolate and bake for 25 minutes at 180°C. Remove from the cake tin and enjoy warm.